Need your daily fix of free apps? We’ve handpicked no less than 82 iPhone, iPad and iPod touch apps that are free today only. 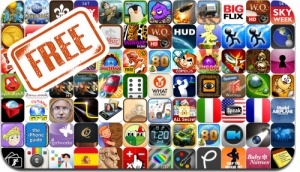 This apps gone free alert includes Bubble Birds, Around the World in 80 Days, Universal Movie Tycoon, Crash Cars, Victory March, Tesla Wars, Escape The Ape, Burst Mode, Super Stickman Golf, DvO, SkySafari 3, and many others.